Why PID Silvia? click here to read What is a PID? When you have a 100% uniform good extraction, even a 5 or 10 degree rise in temperature will not be a problem (meaning, will not produce bitter harsh taste). 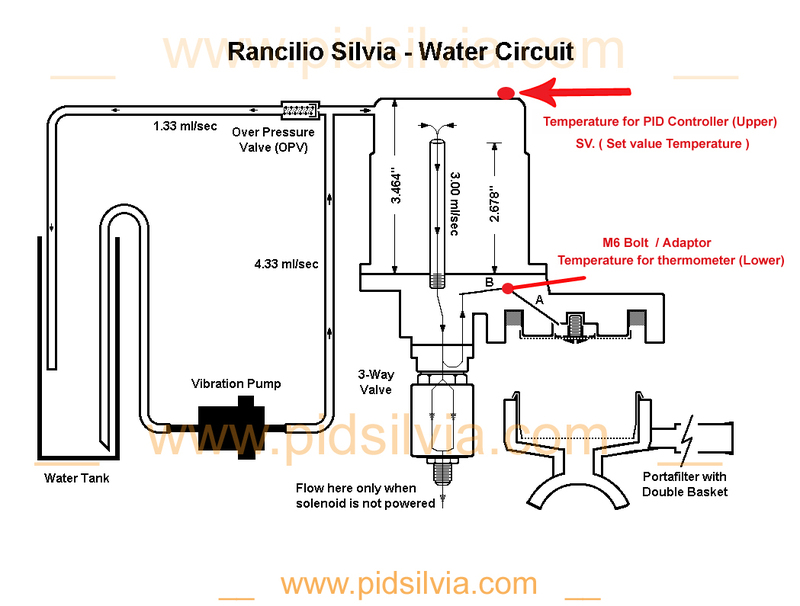 So why install a PID control on the Rancilio Silvia, one of the best home espresso machines? Silvia without a PID, it is like driving a good car without gauges. Brewing temperatures can be too high or too low and difficult to control without PID control, but a PID control allows you to reduce the variables in the brew process by maintaining a consistent boiler water temperature, time after time during a normal brew process. So, before buying the best tamper or the most expensive beans, install a PID control. When brewing espresso, water temperature is one of the most important elements in assuring good taste (although many other factors can create a bitter taste) and providing for a proper soaking of the coffee grinds in the basket to create a proper extraction. Silvia, with a correct PID setup, will protect and extend the life of the heating element, the boiler and Silvia. The PID prevents the boiler from reaching too high of a temperatures in both of the cycles, brew and steam. When properly calibrated, the boiler will never go over 275F=135C. With experience, all functions can be properly performed without the boiler temperature exceeding 260F. see notes 6 and 7 below. With a PID you will have less need for de-scaling, because the boiler is operating at lower temperatures, at the steam cycle. With a PID there is no need for excessive water flushes, or temperature surfing, therefore you do not need to refill the tank or drain the water tray as often. (in some ways, Silvia with no PID is more like a washing machine than an espresso machine). The machine can stay ON for a longer period of time with less effort, less energy, and less stress. With a PID you will not have to wait 2 minutes before you start steaming (you don’t have to wait until the orange indicator light goes off at 284F), because the steaming process can start at 235F which will show on the PID readout while there is no way of knowing if the boiler water temperature is high enough without the PID.it will only take 20 seconds to reach 235F. A PID is extremely useful for this reason alone. In the steam cycle, Silvia’s boiler water temperature without a PID steam limit control reaches over 300F after the orange indicator light turns off (it continues to heat because of thermal lag even after it reaches 284F). However, with a correct PID steam limit control set-up, the boiler temperature will never go over 275F, (or 240F if you start the steaming at 235F) which will help increase the life of Silvia. Note: for one cup (8oz) milk, you will get better frothing when you start at st4aming at the even lower temperature of 225F. Check all videos below and compare the clips of Silvia with PID control to those without PID control. 1st PID unit from bottom has a brew head thermometer at the M6 port, using adaptor. 3rd PID unit from bottom has a thermometer for milk frothing. SV is not the true water temperature inside the boiler since the PID unit is reading the temperature on the boiler surface. SV is only a reference point to allow consistency. The goal is to use an SV so that the average output at the puck is 200F ± 1degree Fahrenheit under the shower screen (some coffees want a slightly higher temperature at the puck and the PID can be adjusted to raise the average temperature above 200F). Since the difference in temperature between the reference point SV and the output at the shower screen can vary depending on setups and use, some experience is necessary to produce a uniform shot, but the PID allows you to produce a consistent temperature with your own setup. Silvia with PID Control, showing consecutive 3 double shots. Silvia with PID Control, showing 4 double shots back to back. These video clips above were done with no editing or cuts, showing real life results in my early days. Silvia with NO PID. is like a hit or miss game.